So, I found this interesting. In the state of North Carolina your $100 will get you $110.01 worth of goods. 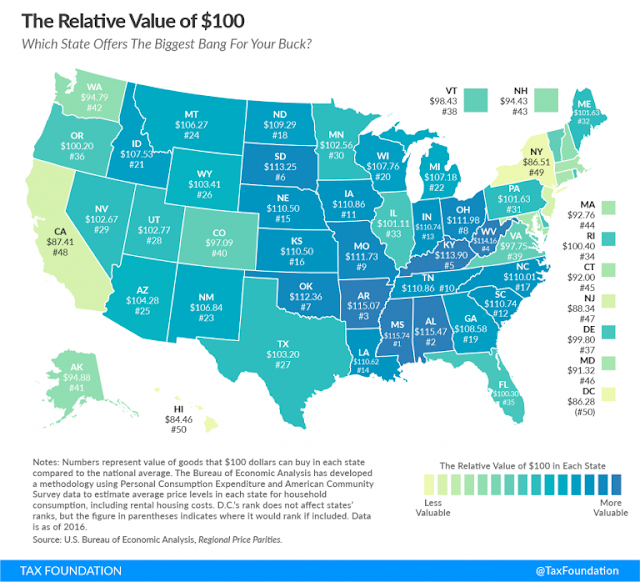 The U.S. Bureau of Economic Analysis recently released a report on the value of goods that $100 would buy in each state compared to a national average. The Tax Foundation created the chart below to illustrate the impact of that report. States with the most bang for your $100 dollars are Mississippi and Alabama which ranked #1 and #2 on the map above. States that ranked last were New York and California where you would only get $86.51 and $87.41, respectively. Hawaii, ranked at #50, turned out to be the worst state. Reflecting, the cost of living in these states is higher but wages and income tend to be higher also. Employers pay a compensating differential which they hope will make up for low purchasing power. In North Carolina, our rank is #17 which is far below 50 percent. Our sister state South Carolina comes in even lower at #12. So, it is probably a fare judgment that our wages are outpacing our purchasing power just a bit. Translate this to real estate and the blogs I have written about home values and it is fair to say that North Carolinians are in a good economic position in relation to purchasing a home. Land is not a finite resource here in North Carolina, so our real estate prices have not been “bid up,” at least not yet. 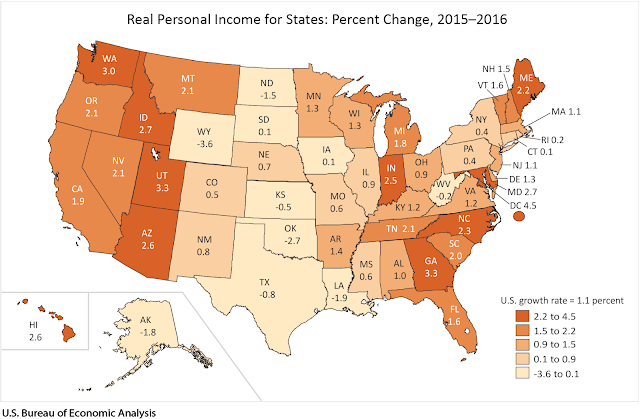 The Bureau of Economic Analysis also put together a chart which shows growth in personal income for all states. Here North Carolina ranks high with 2.3 percent change between 2015 and 2016. Mississippi and Alabama were low in percentage at 0.6 and 1.0 percent, respectively with Hawaii being -1.8. Overall after looking at these charts I would venture to say North Carolina is in a good place right now with a nice balance between personal income growth and how much goods their $100 will buy. With our economy growing stronger every day, it is a good bet that these numbers will change. Hopefully, your income will rise faster than your cost of living.